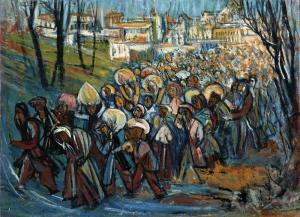 Find artworks, auction results, sale prices and pictures of Marcel Janco at auctions worldwide. 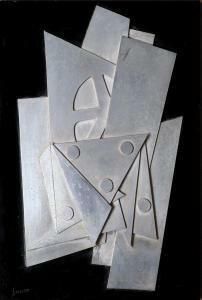 Description: Marcel Janco (Israeli, 1895-1984) Architecture. 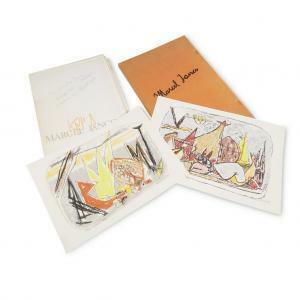 Signed "Marcel Janco" in pencil l.r., titled in pencil l.l., inscribed "Epreuve d'artiste" in pencil l.c. 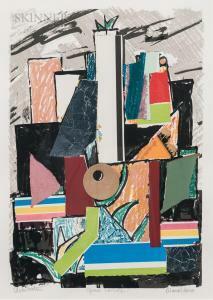 Color lithograph with collage on paper, image size 19 7/8 x 13 5/8 in. (50.4 x 34.5 cm), framed. Condition: Gentle rippling, not examined out of frame. 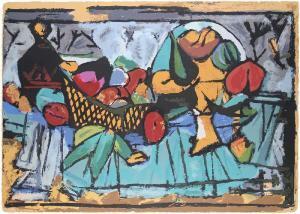 Marcel Janco (1895-1984) Israeli TABLE WITH FRUIT, color lithograph, signed and titled in pencil, numbered 144/200, printed by Mambush Ein-Hod Israel with blind stamp lower right, image 16 ¾ x 23 ¾\”, full margins, framed. Provenance: Michael Hittleman Gallery Los Angeles.ConditionSome pale discoloration at sheet edges, some soft impressions from hinges, otherwise in apparently good condition.